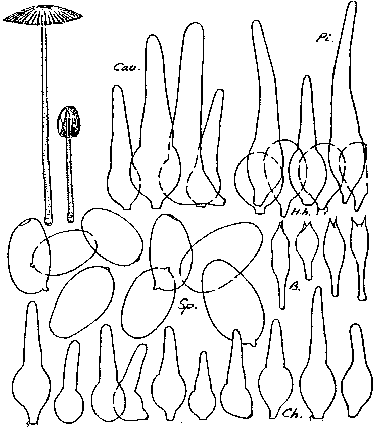 Coprinus amphithallus M. Lange & A.H. Smith in Mycologia 45: 774. 1953. Closed pileus up to 8 x 5 mm, expanding to 18 mm in diam., cream with dark brown to cinnamon-coloured centre (Mu. 7.5 YR 3-4/4 to 4-5/6, K.& W. c. 6D6), later more grey (Mu. 10 YR 5-6/1, K.& W. 5C/D2), disk and radial stripes staying brown for a rather long time. Lamellae narrowly adnate, up to 1.5 mm broad, whitish, then grey to blackish; L = c. 20, l = 0-1. Stipe 30-80 x 1-1.5 mm, whitish, somewhat vitreous, sparsely pubescent. Spores [60,3,3] 12.3-15.6(-19) x 6.7-8.7(-9.5) µm, av. L= 13.2-14.2, av. B= 7.4-7.9 µm, Q= 1.65-1.90, av. Q= 1.75-1.80, ellipsoid to ovoid; germ pore eccentric, c. 1.8 µm wide. Basidia 21-34 x 8-11 µm, 2-spored. Pseudoparaphyses not noted. Cheilocystidia 25-40 (-50) x 10-16 µm, lageniform with tapering neck, 2-3 (-5) µm wide at apex. Pleurocystidia absent. Pileocystidia 40-85 x 10-16 µm, lageniform with tapering neck, 4-7 µm wide at apex. Clamp-connections present. At clayey-sandy roadsides, often among grasses. Solitary or subgregarious. Rather rare, Europe, N-America. 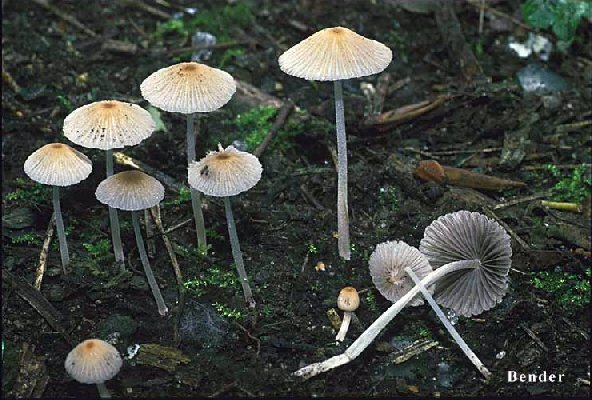 Coprinus amphithallus is a terrestrial, two-spored species with lageniform cheilocystidia. Microscopically the closest species is C. singularis, which has smaller fruit-bodies and broader spores with a central germ pore. The shape of the spores is different also in these two species. The other two-spored species in subsect. Setulosi grow on dung (except C. verrucispermus) and have globose cheilocystidia. C. verrucispermus has warty, differently shaped spores. More or less at the same time that Lange & Smith described C. amphithallus, Kühner & Romagnesi (1953: 391) gave a description of a species provisionally named C. disseminatoides. That species seems to be identical with C. amphithallus, a fact recognized by Kühner (1957: 61) when he gave a description of C. amphithallus and placed C. disseminatoides in its synonymy. (see also Bender en Enderle, 1988: 45-48).